Today, Vacation Bible School—better known as VBS—remains one of the most popular church programs in America. LifeWay Research released a few findings from a study that discovered 69% of American parents (churched AND unchurched) would encourage their children to attend VBS if they were invited by a friend. Let that sink in a minute—IF they were INVITED. All it takes is an invitation? What are you waiting for? Let’s get started! LifeWay is committed to offering high-quality, affordable VBS resources that share the Good News of Jesus accurately with all ages. A personal invite will go a long way in reaching children in your community. Make sure to encourage your VBS leadership (directors, teachers, organizers, parents) and church members to invite people. Having invite cards ready to go makes it easy. 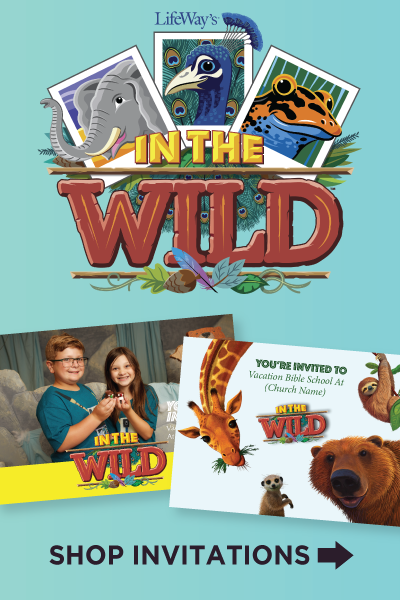 LifeWay Prospect Services offers a variety of postcard invitations to help you connect with your community and invite people to your VBS, regardless of your theme. Pair your chosen postcard with a families with children mailing list to speak directly to households with children for as low as 82¢ each, including postage. Plus, there's a quick turnaround—we will mail your postcards in only 2 business days. For VBS crafts, snack, games and more check out our Pinterest boards!